Mike Lazaridis is one of the key executives affiliated with the rise of the famed BlackBerry. While BlackBerry has become a staple of corporate communications, the past few years have been hard on Research In Motion, which has been slow to compete with more full-featured smartphone devices, especially Apple's iPhone and Android from Google. We'll ask him what happened and look forward to the future evolution of BlackBerry, as well as RIM's foray into the tablet game with its PlayBook, and how he will stop an eroding market share for the company. Mr. Lazaridis holds honorary doctoral degrees from the University of Waterloo in engineering, McMaster University, University of Windsor and Université Laval. He has been awarded Canada's most prestigious innovation prize: The Ernest C. Manning Principal Award. It’s decision day for BlackBerry’s leading bidder. 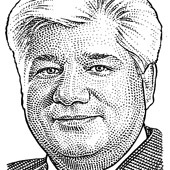 Mike Lazaridis is considering taking a run at the company he founded. Former BlackBerry co-CEO has been talking with private equity firms about possibly mounting a joint bid for the struggling smartphone maker. No plans to divest as of right now. The two men who started BlackBerry maker Research In Motion Ltd. some 30 years ago are bankrolling a $100 million investment fund targeting commercial applications for advancements in quantum science. RIM CEO Thorsten Heins drops the “happy happy joy joy” talk at the company’s shareholders meeting. Was Jim Balsillie Trying to Push a Strategy Shift Before Leaving RIM? CEOs Are Out, but Will RIM’s Leadership Shake-up Be Enough to Placate Angry Investors? If you’re considering upgrading Office with Office, we’d encourage you to consider an alternative: upgrading Office with Google Docs. — Matthew Glotzbach, Google Enterprise Product Management Director, celebrates the launch of Microsoft Office 2010.